Teaching your children a new skill can be one of the biggest challenges you ever have to face. This is when you should learn more about the tips which you can use to start to teach your kids how to cook. When your children know how to cook, they can easily prepare food for themselves or their future families to eat all the time. Without the tips, you can still teach them to cook, but the chances are higher for frustration to be present. This can may lead to you and your children not having any fun while cooking. The basics are the hardest thing for your children to learn. Now you may think this is going to be silly, but the first thing you need to do is teach your children about all the different utensils you will be using inside of the kitchen. For example, you may need to teach them about the different skillets, pots, dutch ovens, and even the types of knives inside of your kitchen. When you do all of this, it will make it easier for your children to know which of the items you are asking for when you are cooking together! After you have taught them about the different utensils and pots in the kitchen you should teach them how to do measurements. Now if your children are older, they may have already started to learn this in school. However, it is not uncommon for children to start to help their parents at a younger age. This can lead to them needing to know more about the measuring cups and how these work. For example, you will need to educate them about the abbreviations, but also where the measurements are found on any of the cups or spoons which you plan on using. Teaching your children how to read recipes is a good step to take as well. This step is the one where you will whip out the old cookbooks and teach the children where each item they need is found. Then you will want to tell them how to read the recipes and why it is so important for them to follow the recipe to the letter. Without this, you may find your children are going to deviate from the recipes and this can lead to a failing cake, or even worse, food poisoning. If your children are not old enough to read, then you will want to find a book which uses pictures to provide them with the knowledge of learning what they need to use and when. A simple Amazon.com search will reveal some several kid-friendly cookbook options. 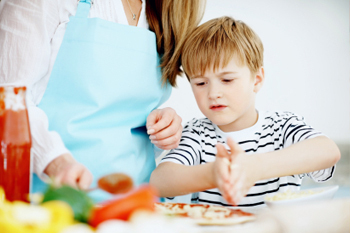 4.Letting your children take the helm for cooking! This is the step where the real cooking will begin. In this step, you will start to educate your children about how to properly prepare all the food and get it ready to be eaten. For example, you will want to let your children do as much as you are comfortable letting them do. However, you should make sure they are old enough to handle a hot pot if they have to. If they are not old enough, then you may need to consider doing this part and have them help with the preparation of the foods A task such as helping to shred lettuce for salad or butter bread for sandwiches as skills that will go a long way! The final tip you can use is to guarantee your children know how to check if the food is done. This does not mean tell the child to wait until the smoke detectors go off. 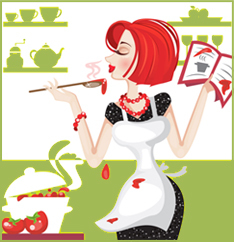 You will want to teach them how to do the timing and when they should stir foods and such. When you do that, you will confidently know they can properly prepare any of the foods you or their future family wants to eat, without worrying about serving under cooked foods.